This one did not want a photo taken. Once again looking for your help with the name of this duck. I believe it would be from the Orient somewhere. The photo was taken In Guam. 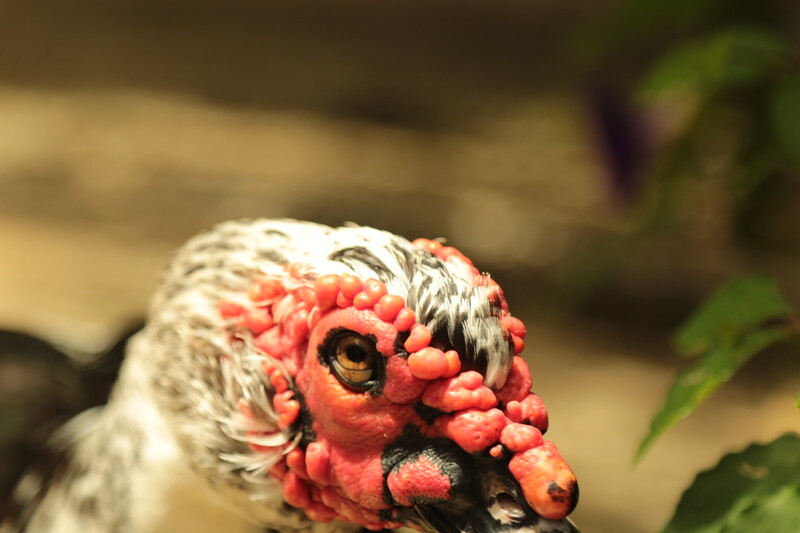 Interesting close-up shot of this Muscovy Duck. Lol! Maybe it didn't want to break your camera! Good clarity and details though! For sure a Muscovy duck, with a nice set of face caruncles (which are used to attract females and also in thermoregulation). They are related to the wattles in turkeys and other birds. It is a Muscovy Duck, but not the type that is found in the wild. I've seen wild Muscovies in S Texas, but the ones like this you see in parks are domesticated, and vary a lot in colors and facial characteristics. Any in Guam...not sure of their origin, but probably similar background. Neat closeup! Gene Hyder often takes photos of this kind of duck; perhaps, he can help identify it. Great close up of this fellow!